This fantastic ray gun sculpture will bring your childhood adventure fantasies flooding back. Look out, Captain! The creature is behind you! It's been a long time since you felt the thrill of those classic sci-fi adventures, whether in a darkened theater or on the Saturday morning TV screen. Your tastes in entertainment may have matured since then, but one blast from this fantastic laser gun replica will bring that old magic flooding back. Either a grown-up toy or a youthful work of art, this galactic artifact is the creation of Michigan artist, Scott Nelles. Nelles uses a sand mixture to create casts of his original prototype (an exact copy of one given to me by alien beings, he insists), and then pours molten bronze and recycled aluminum into the forms. The resulting sculpture has a rich texture and patina, as if battle-worn from your days in the Galactic Cadets. With the included display stand, it makes a far-out conversation piece for your home or office. Handmade in Michigan. 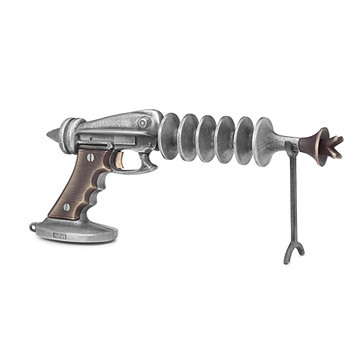 Display stand included (shown towards the right side of the image; the vertical beam propping up the barrel of the Ray Gun. I gave this to my husband for a 10th wedding anniversary gift (aluminum), and couldn't be happier with my gift choice! He is so hard to buy for (because he buys whatever he needs/wants)...and he absolutely loves his ray gun!! My husband loved the Ray gun! He thought it was absolutely perfect. First piece from Scott. It's really visually pleasing and the craftsmanship is top notch. A fully functional* raygun with heft! This was a birthday gift for my fiancee who grew up watching Star Trek and Lost in Space. When he opened it, it brought back wonderful memories of wanting to be Captin Kirk or Don West fighting off the aliens. In addition, my fiancee is not only an artist himself, but also an art collector, and this truly is a piece of art, and it has a prominent place in his collection. Everything I ever wanted in a raygun!! Wonderful Sculpture. I love it!! How could anyone not love it, too? We currently have it displayed in our bedroom and it looks great. It was easy to install and he absolutely loved it. I have nothing bad to say about this product.